***For the first time and after some days of testing the YN560EX I have to say , this flash is in my opinion the best ( by far) value for your money! Now after revealing my bottom line, go on and read further or go and buy yourself some! (at the end of the post to read why I’m so impressed). 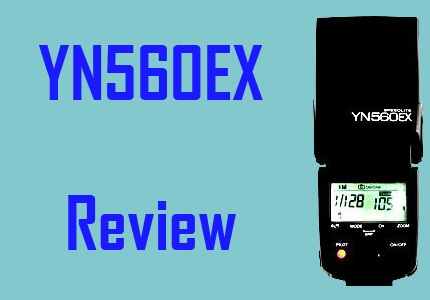 Hi I finally got the new YN560EX flash for a review and had to run my tests on it for a while, but I’d like to share some of my first impressions in this post, and there are some nice things to say about the YN560EX, so keep on reading!!! Update: There is a new model to the YN560x series you might be interested in – YN560III with build in RF602/603 trigger, previewed here. The YN-560EX can be triggered by 580EX II, SB-900/800/700, 7D/60D/600D, Nikon c-command and ST-E3, and flashes in i/ETLL mode as well as M/Multi mode. To enjoy wireless TTL lighting, ratio control, as well as remote control of output level, you may only take a camera with built-in commander mode, and the YN-560EX. A new appearance: It has a nice LCD screen and better looking/feeling buttons than the “Old” yn560II. Multi flash supported: You can set the flash to fire a burst of flashes during a desired period of seconds. GN58 @ ISO100, 105mm: about the same as the Canon 580EX or Nikon’s SB-900. 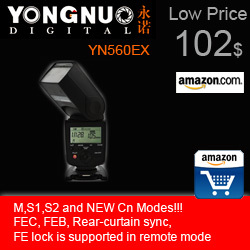 Multiple trigger mode supported: The YN-560EX can be triggered by hot-shoe, flash command slave mode, optical S1 and S2 (per-flash-cancelled mode). This one is build of different materials than the YN you got used to. The plastics hava a better feel, they are a bit more rough feel. You will also see a new button materials (their position is the same). The battery compartment is a little different ,you’d have to slide in down to open it, but if you used the YN560II before you’d see the difference. While the YN560II and the YN565EX had the same Canon 580EX body with the Canon 430EX back, they gave the YN560EX its own look. The rear LCD screen – once again I was very pleased with the addition of the LCD screen that came with the YN560II, a big big improvement/leap from the led display of the old YN560 and the cheaper YN460. The screen here gives the same data, but the important digits come in bigger size and are clearer. I like it this way. It works great and as published. It has 4 slave modes ,the usual S1/S2 optic slave, who became a standard today (S1 – Fires with every flash he feels while S2 – knows how to ignore pre flashes ). What really interests us are the SLAVE c and SLAVE n modes. Slave c – Means it can take commands from Canon master controllers , Cameras, flashes and triggers. Slave n – Means it can take commands from Nikon master commanders , Cameras, flashes and triggers. If you have a camera that can control the flash via built in menu (5MKII,600D,7D and so on) you can control the flash from the camera without touching the flash and it works!!! You can switch from ETTL to Manual flash modes without touching the YN560EX, you can adjust its power and flash compensation. If you have more than one YN560EX flash, you can set them to different groups (A+B+C) and control each one of them separately (I promise to put a post about it later) . Like the YN565EX, it doesn’t supports HSS, and will go as fast as your camera flash sync will let it. I must say that I’m hiring a good feedback from photographers who use the YN568EX (about 185$) that does HSS, so you can try it too. I must say that I’m new to this, there was a time that I photographed weddings, holding the second flash up with my left hand , and that was the only time I used the IR Canon controller , but now I’m sure I’ll use it much more, especially combined with the YN622C controllers I have now! I just finished a photo shoot in Alaska. In one situation, I was using all my Nikon flashes and needed an extra flash in a dark corner of an old building. One of the other photographers there had one of the Yongnuo YN560EX flashes. Since I’ve only used the Nikon flashes I declined the offer. But after searching frantically, I submitted to it. HOLY COW! This thing kept pace with my SB-900s. I was thoroughly impressed. If anyone wants a great flash at an affordable price, I suggest they seriously look at these flashes. Of course my Nikon flashes have some slight advantages to the Yongnuo, but for the money these are great flashes at half the price of brand names. Yes I think that for the money, this one (and the 560II too), gives the best value for money, that simple. There is the Oloong sp660II that can do TTL slave, but costs about 10$-15$ more and is less powerful (only 50GN) . I’m not surprised that the YN’s have the same recycle times as your SB’s, my YN’s ,and I have about 6 of them, recycle a bit faster than my Canon 580, they are super fast! You probably mean the fact that the YN560EX do not have an extarnal battery socket? I have built up a small System of two YN560EX, one SB600 and an SU-800. And well, it works as it should. The YN560EX ist in my opinion at present the best an cheapest TTL-flash on the market. For the ones who use the IR in Canon or the SU in Nikon, this flash is nothing but amazing. Fantastic flash for the price and I use Aokatec AK-TTL wireless triggers with my Nikon D7000, you can remotely control your flashes via a commander in your camera, or an SU-800, commander capable flash and control the output of the flash using TTL or full manual control. How good is that! Yes, if you use the SU800 or a Canon controllers, this flash is absolutly a bargain.